Ochre stars were decimated by the wasting disease. The cause of the outbreak, which they call “one of the largest marine mass mortality events on record,” is still somewhat mysterious. Researchers theorize the disease is a densovirus, which has existed in the region for decades, but may have proliferated in response to climate change impacts such as warmer waters or ocean acidification. 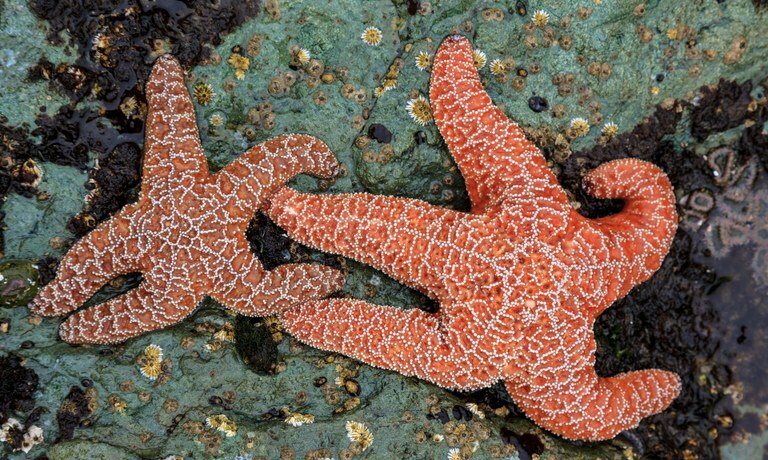 In the early summer of 2013, scientists first started noticing sea star deaths, and soon many tidal areas up and down the West Coast once crawling with purple and orange stars were nearly empty. Over 80 percent of ochre stars fell victim to the epidemic. The trend was particularly disturbing because the species is a keystone of intertidal areas along the West Coast, and its disappearance could have a profound effect on ecosystems. “The sick ones tend to just fall apart in front of your eyes. An arm will actually break off and crawl away,” Jeff Marliave, a Vancouver Aquarium biologist, told a Seattle radio station in 2013.